Welcome to the Black Student Union’s website at the University of Mississippi. Please utilize our website to find information about BSU and other campus events and organizations. 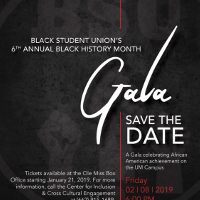 The Black Student Union will be hosting our 6th Annual Black History Month Gala and we encourage all members to attend! This will be a fun night of celebrating our community and black excellence on our campus. The gala will be at the Inn at Ole Miss on Friday, February 8th, 2019 at 6:00pm. Tickets will be distributed (with an Ole Miss student ID) at the Gertrude Ford Center. We look forward to seeing you there. Please contact bsu@go.olemiss.edu with any questions!